Prior to submitting massively parallel sequencing (MPS) data to NCBI, you want to register (1) your project and (2) those samples involved in a given project. Registering your samples as [NCBI BioSamples](https://www.ncbi.nlm.nih.gov/biosample/) is the second step of this process (the first is to [[Register an NCBI BioProject]]). 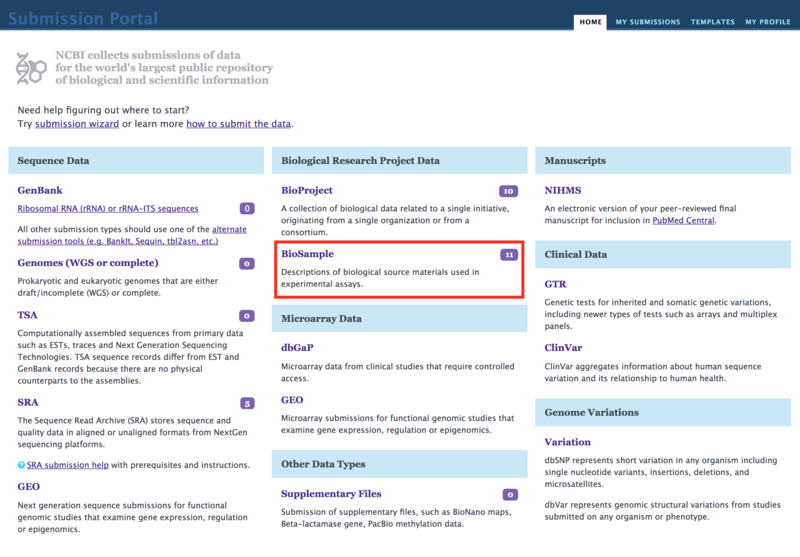 You can register a BioProject and BioSamples before you plan to upload your data. That said, our laboratory policy is to upload all the data, all the time prior to publication (and usually prior to making a paper available as a pre-print). If you have not done so, Register an NCBI BioProject. Click on the New submission link. The Submitter info should be the same as what you used for your BioProject. Click Continue . On the General Info tab, specify a Release Date and select Batch/Multiple BioSamples Click Continue . On the Sample type tab, select Model organism or animal sample . Click Continue . On the Attributes tab, download the Excel template for your BioSample. Follow the instructions on the worksheet. Most of the fields have a detailed description if you hover your pointer over the top right corner of the cell. You should have one BioSample for each specimen, and each of your BioSamples must have differentiating information (excluding sample name, title, bioproject accession and description). This check was implemented to encourage submitters to include distinguishing information in their samples. If the distinguishing information is in the sample name, title or description, please recode it into an appropriate attribute, either one of the predefined attributes or a custom attribute you define. If it is necessary to represent true biological replicates as separate BioSamples, you might add an ‘aliquot’ or ‘replicate’ attribute, e.g., ‘replicate = biological replicate 1’, as appropriate. Once the Excel sheet is completed, save it as a tab delimited text file and upload it on the Attributes tab. Click Continue . The Comments tab will tell you any errors or warnings associated with your BioSample worksheet. Be sure to correct all errors before continuing. Warnings may be ok. Click Continue . Review the submission on the Overview tab and click Submit at the bottom if no other changes are necessary. Wait for the BioSample to be processed. Sometimes, taxonomy differences between your “organism” (from table above) can conflict with the entries in NCBI Taxonomy, and sometimes the changes needed can get hung up at NCBI. If you’ve been waiting for more than 3-4 business days for your BioSamples to process, you should email NCBI at the contact for BioSamples (biosamplehelp@ncbi.nlm.nih.gov). BioSample accessions:  SAMN05915021, SAMN05915022, ... see attached file. See object links in the attachment to this message. SAMN05915029, SAMN05915030, ... see attached file. in any correspondence. If you are uploading data to NCBI SRA proceed to :ref:`Submitting Read Data to NCBI SRA`_.